On the left hand side of the “Edit Widget” page you’ll see a new option (number 5) entitled “Choose a Header Image?” Click “Browse” to find the image you want to use. 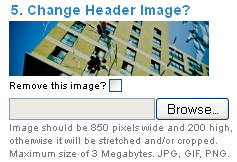 It can be an image in JPG, GIF or PNG format. We recommend that it’s at least 850px-wide, otherwise it’ll look stretched when it appears on the header. Also bear in mind that it will be cropped and resized, so if there’s any important information in it – like a sign showing the name of your property or an award you’ve won – make sure it’s at the centre of the image. Tick it, then click “Save”. The image will now vanish from the Availability Page.